Obamacare tax flip-flop: Romney’s evolving record on whether health insurance mandates are a tax. Mitt Romney’s evolving positions on whether mandatory health insurance is a tax. 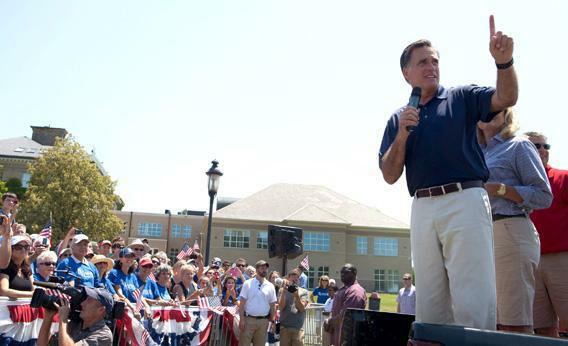 Mitt Romney addresses a crowd during the Wolfeboro Independence Day parade on Wednesday in New Hampshire. Since serving as Massachusetts governor, Romney has described an insurance mandate as not a tax, a tax, and a penalty. Also in Slate, read John Dickerson’s piece on how Romney is struggling to get on-message on the Obamcare decision, and Dickerson’s piece on how the tax vs. penalty battle helps neither Obama nor Romney. Does Mitt Romney think that penalizing people who don’t buy health insurance is a tax? The answer depends on when you ask him and whether he’s the guy who imposed the penalty. Here’s how his position has evolved over the years. There is no need for new or increased taxes; funds now used to pay for the uninsured—almost $1 billion—instead will subsidize insurance premiums, where needed. Medicaid reforms generate further savings. Costs are also reduced when the newly insured get clinic-based preventative care rather than late-stage emergency care. And more people and their employers will cover or contribute to the cost of their insurance. … [M]y plan calls for a personal responsibility principle: Everyone must either become insured or maintain adequate savings to cover their medical expenses. We cannot expect some citizens to pay for others who can afford to pay some or all of their own way. It’s not a tax hike. It is a fee. It’s an assessment. … It applies to people who are abusing the free-care pool and who are excessively using the free-care pool, and some incentive to avoid that is appropriate. But it’s not a tax. It’s not a broad-based program. What began as a tax had me very concerned, which is the initial proposal that was discussed in the House, that both the senate president and I said we can’t go there, [which] is on a payroll tax. Romney sees the employer assessment, like the bill’s tax penalty on individuals who fail to buy insurance, as fundamentally different from taxation because it targets freeloaders. Every uninsured citizen in Massachusetts will soon have affordable health insurance and the costs of health care will be reduced. And we will need no new taxes, no employer mandate and no government takeover to make this happen. … I proposed that everyone must either purchase a product of their choice or demonstrate that they can pay for their own health care. It’s a personal responsibility principle. Some of my libertarian friends balk at what looks like an individual mandate. But remember, someone has to pay for the health care that must, by law, be provided: Either the individual pays or the taxpayers pay. Romney reaffirms that the bill, despite its penalty for freeloaders, imposes no new taxes. And again, he frames this approach as the alternative to taxpayer-funded care. April 12, 2006. Romney signs the bill into law. In the first paragraph of his press release, he proclaims: “Today, Massachusetts is leading the way with health insurance for everyone, without a government takeover and without raising taxes.” He notes that “failure by individuals to purchase health insurance will result in the loss of their state tax refund equal to 50 percent of an affordable health insurance premium.” But he describes this sanction as “penalties,” not taxation. First, we established incentives for those who were uninsured to buy insurance. Using tax penalties, as we did, or tax credits, as others have proposed, encourages “free riders” to take responsibility for themselves rather than pass their medical costs on to others. This doesn’t cost the government a single dollar. Here, Romney adopts the hybrid term “tax penalties,” but he insists that this practice “doesn’t cost the government a single dollar.” He sees the penalty not as revenue but as a prod to take personal responsibility. June 28, 2012. The U.S. Supreme Court rules that Obama’s individual mandate is unconstitutional as regulation of commerce but is constitutional if interpreted as a tax. Sen. Mitch McConnell of Kentucky, the Senate minority leader, quickly declares, “The Supreme Court has spoken. This law is a tax.” But Romney, speaking a few minutes later, doesn’t bite. He confines his comments about taxation in the law to provisions other than the mandate. Todd: So he agrees with the president … and he believes that you shouldn’t call the tax penalty a tax, you should call it a penalty or a fee or a fine? Fehrnstrom: That’s correct. But the president also needs to be held accountable for his hypocritical and contradictory statements. But he’s described it variously as a penalty and as a tax. July 4, 2012. In an interview with Jan Crawford of CBS News—six days after the Supreme Court ruling, six days after declaring his disagreement with the ruling, and two days after his campaign issued a press release reaffirming that the mandate was a penalty, not a tax—Romney announces that the court’s ruling has changed his view on that question. Crawford: Have you changed your views on this? Do you now believe that it is a tax at the federal level—that the Supreme Court has said it’s a tax, so it is a tax? Romney: Well, I said that I agreed with the dissent, and the dissent made it very clear that they felt it was unconstitutional. But the dissent lost. It’s in the minority. And so now the Supreme Court has spoken. … They concluded it was a tax. That’s what it is. And the American people know that President Obama has broken the pledge he made. He said he wouldn’t raise taxes on middle-income Americans. Not only did he raise the $500 billion that was already in the bill, it’s now clear that his mandate, as described by the Supreme Court, is a tax. Crawford: But does that mean the mandate in the state of Massachusetts under your health care law also is a tax, and that you raised taxes as governor? Romney: Actually the chief justice, in his opinion, made it very clear that at the state level, states have the power to put in place mandates. They don’t need to require them to be called taxes in order for them to be constitutional. And, as a result, Massachusetts’ mandate was a mandate, was a penalty, was described that way by the legislature and by me. And so it stays as it was. Let’s recap. First Romney said that the individual mandate, far from being a tax, was the alternative to taxation. Then he said fees targeted at freeloaders to cover the cost of health insurance weren’t taxes. Then he said tax penalties for failure to buy health insurance didn’t count as government revenue and spending. Then he said requiring people to pay higher taxes for not buying health insurance didn’t count as raising taxes. Then he refused to join other Republican leaders in saying that the Supreme Court ruling made the individual mandate a tax. Then his campaign issued a press release saying that he continued to view the mandate as a penalty, not a tax. Then, yesterday, he announced that that although he personally agreed with the court’s dissenters that the mandate was a penalty, not a tax, he now accepts the verdict of the court’s controlling opinion that the mandate is a tax. But he says this doesn’t apply to his own mandate, even though his mandate, like Obama’s, meets all the criteria he has enumerated over the years for distinguishing a penalty from a tax. And he says Obama, by imposing the mandate, broke his promise not to raise taxes on the middle class. I didn’t think Romney could top the audacity of his self-reinvention on abortion. Looks like I might be wrong.